What is an Anti-theft Travel Backpack? Safety is always a concern when traveling, especially in some of the world’s most visited cities like Barcelona, Rome, or Paris. 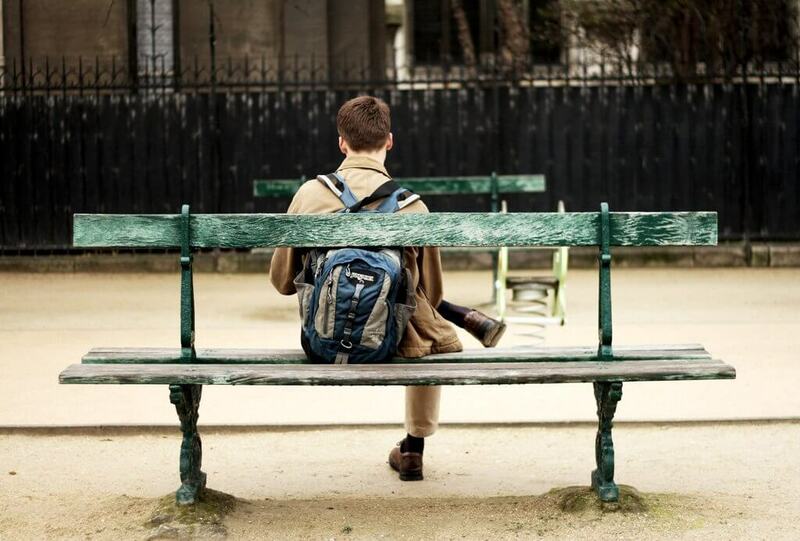 Using a secure backpack for travel should always be a priority, theft proof backpacks designed to keep your passport, cash and other small valuables attached to you until the end of your trip. 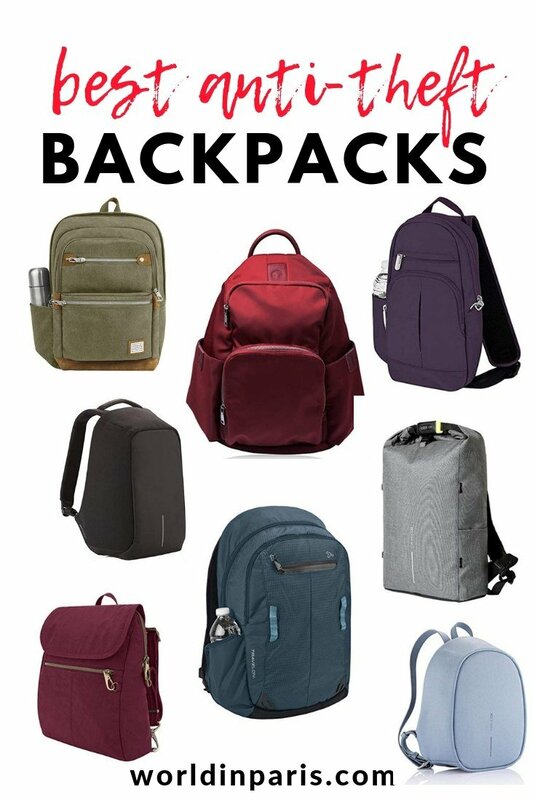 Fortunately for us travelers, there is a variety of brands that make anti-theft backpacks and bags with interesting security features for safe travels. 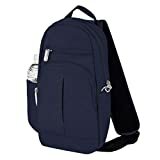 If you are worried about things getting stolen from your backpack, and you are looking for the best anti-theft backpack, this is the anti-theft backpack review for you! Anti-theft bag or Anti-theft backpack? While shoulder bags are easy to grab and can be positioned towards the front so you never lose eye contact, carrying a heavy one for a long period of time can be detrimental to your natural gait. 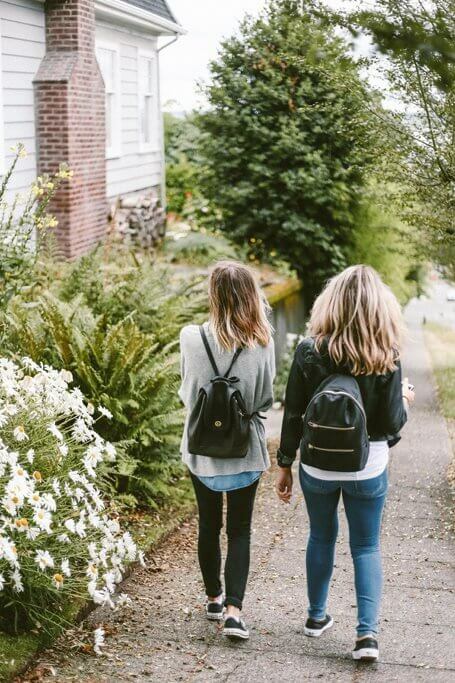 Backpacks, instead, distribute the weight that you are carrying evenly across your back instead of focusing it on one side, maintaining your body’s natural gait and maintaining a balanced muscle tone. 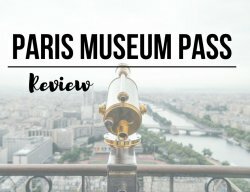 In this anti-theft backpack review, we are going to talk about anti-theft travel backpacks only. The choice of secure travel backpacks is very large and there are a variety of styles available, depending on the kind of travel you are planning. Anti-theft backpacks are also popular for daily situations such as school or commuting, or shopping days. An anti-theft travel backpack is a theft-proof backpack designed to prevent, or at least delay theft. 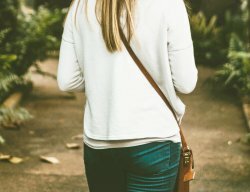 What makes for a good anti-theft backpack? The majority of them rely on the design, on arranging the backpack’s main compartment and pockets in such a way that it’s difficult (if not impossible) for someone to access the backpack while you’re wearing it. 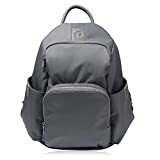 Other usual anti-theft backpack features include a slash resistant construction, lockdown hardware, locking zippers, or RFID protection for your passport and card slots. On this review, we are taking a look at some of the best anti-theft backpacks in the market and give you the most important information to help you decide which anti-theft daypack is the best option for you. These backpacks are specially designed for exploration trips anywhere in the world or weekend getaways. However, all of these anti-theft bags work just as well for daily use, and sometimes an evening out. We have chosen anti-theft backpacks for women, anti-theft backpacks for men and models that suit men and women. The links show most of the anti-theft bags below in black but they do come in multiple colors, click-through on each item to check the range. The Bobby Urban Lite is an anti-theft laptop backpack made of high-quality, water repellent polyester and with a sleek and adventurous design. The Bobby backpack is available in black, grey and navy blue. Its main anti-theft backpack features include a rolling and combination lock mechanism for the main pocket, hidden pockets, and RFID protection. The Bobby Urban Lite backpack has a padded compartment to store a 15.6″ laptop and mesh pockets for other belongings. 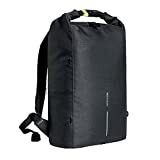 Other interesting features of this anti-theft travel backpack are a reflective print for night safety, an exterior water pocket, and a detachable elastic net on the front for the sports equipment. Pockets: main padded pocket for 15.6″ laptop or tablet, mesh pockets, hidden pockets in the shoulder strap and in the back, slip pocket on the side for a bottle. 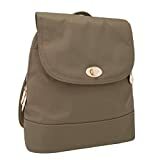 The Travelon Anti-Theft heritage backpack is a beautiful vintage backpack with a roomy and padded main compartment to hold a laptop up to 15.6″ and additional and lockable pockets. The backpack itself is a little on the heavy side when empty but this is because it has that anti-slash meshing so it is well worth it! Main anti-theft backpack features include slash-resistant shoulder straps, locking straps and compartments and RFID protection. We definitely love the great look and vintage style of this backpack! The XD Design Bobby Original is one of the smallest anti-theft backpacks of this anti-theft backpack review (13 L), great for those who do not have much to carry or who just want to travel light. Presented as the safest backpack, its cut-resistant protection, good anti-theft design (the main compartment opens from the back) and hidden pockets definitely give a feeling of safety in a packed train. Additional features include illuminating safety strips, shockproof, an integrated USB charging port to charge your phone while on the go, and weight balance, with less pressure on the spine. The Travelon Anti-Theft Signature Backpack combines function with a beautiful and stylish design. 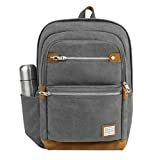 This is a great bag for the everyday traveler, not too big but not too small, well organized and with lots of well-placed pockets. The roomy main compartment has RFID blocking card and passport slots and there’s also an open top wall pocket and a zippered wall pocket. This is a lockable backpack meaning that the straps have a lock you can unhook and hook and lock the bag to a rail or chair so you don’t have to wear the bag while eating. Designed to suit men and women, the Travelon Anti-Theft Urban Backpack is ideal for adventures abroad or your daily commute. Despite its sturdy design and generous size, it’s surprisingly light in weight. The backpack has a clean design with well-organized compartments and pockets. The roomy, padded main compartment holds a laptop to 15.6″ or a tablet while its separate front compartment has RFID blocking card and passport slots. The cool mesh back panel and the padded carry handle are a plus for your comfort. Pockets: main compartment for your laptop or tablet, separate front zippered compartment with RFID protection, zippered wall pocket and a mesh expansion pocket for a water bottle. The Anti-Theft Tailored Backpack is a stylish, small backpack perfect for carrying your essential items at work, school or on a day trip. The main compartment of this beautiful backpack has an open top pocket, a padded pocket to hold a tablet or iPad, and a zip wall pocket. Its main anti-theft features include slash resistant mesh body panels, and shoulder straps, RFID blocking for your cards and passport and locking straps and compartments. 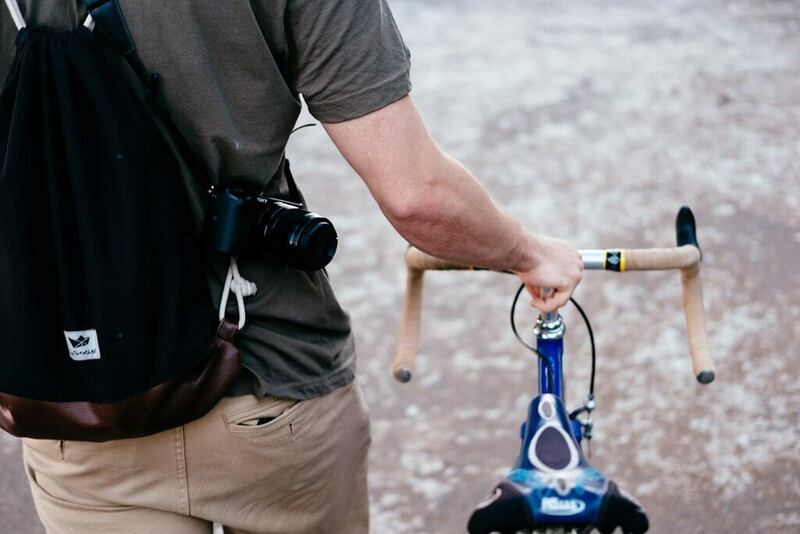 The top grab handle offers an additional way to carry the backpack, depending on the occasion. This is a lockable backpack that can also be secured to a stationary object, which is great for keeping your items safe and secure while eating in a restaurant or a terrace. This slash-proof backpack is a not too big – not too small travel backpack, perfect for carrying your essential items. 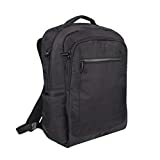 Plain and simple, Travelon Anti-Theft Classic Backpack is great for anyone who doesn’t want to lug a big backpack all day but large enough to carry what they need. Thanks to its stylish design, this secure backpack can be used also for everyday use. This minimalist, lightweight and slash-proof backpack is perfect for carrying your necessities. Plain, simple, and practical Travelon Anti-Theft Classic Lite Sling Backpack can be worn over either shoulder with a reversible should strap. It can also be worn in front as well (which is very interesting when you are in large crowds). As for security, this bag has all the typical anti-theft measures that can be found on any Travelon bag of this type so pick-pockets cannot get into this bag without you knowing it. 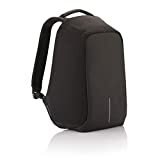 Pacsafe Citysafe CS300 Anti-Theft Compact Backpack is a versatile compact backpack perfect for traveling or for your everyday life. Resistant, and with a good pockets organization, the Pacsafe Citysafe CS300 doesn’t take up much room and it is lightweight, but it can hold many things. In addition to all the typical anti-theft measures you are looking for, Pacsafe Citysafe CS300 includes a turn & lock security hook to secure the bag to a fixture for added security. With Pacsafe Citysafe CS300 it is very easy to travel safe. Pockets: zippered main compartment with RFID protection for cards and passport, zippered front compartment, 11-inch laptop-compatible padded sleeve, side pockets. XD Design Bobby Elle Anti-Theft Backpack is the last design of the Bobby family. 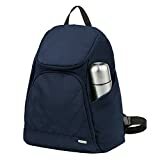 This stylish backpack is small and compact (6.5L) but the inside of the bag is very well designed with plenty of pockets and water bottle holder. Presented as the safest backpack, its cut-resistant protection, good anti-theft design (the main compartment opens from the back) and hidden pockets definitely give a feeling of safety in a packed train. XD Design Bobby Elle Anti-Theft Backpack is made of lightweight faux leather material and it is water repellent. Pockets: main compartment with padded tablet Compartment that holds up to 9.7″. Strategically placed hidden pockets on the back of the backpack give easy access to smaller items when needed. Anti-theft features: hidden zippers & hidden pockets, cut resistant, no front access. 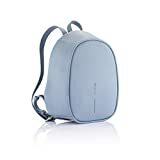 We love Befen Women Anti-Theft Backpack, an anti-theft backpack for travel with a large capacity (25 L), and many compartments to keep your essentials well organized. Made of high quality and water-resistant nylon, the genius lies in the main section, which is securely against your back where pickpockets can’t get to. Befen Women Anti Theft Travel Backpack is suitable for daily activity or travel use. Proposed in different colors, it can fit with casual to a bit more dressy style. Pockets: front zipper pocket, top zipper compartment with inside phone holder, 2 side pockets for water bottle or umbrella, safety back zipper compartment with 6 card slots and an inside zipper pocket. Do you want a travel backpack for exploring exotic countries or for your weekend getaways? Will you be traveling with a laptop? These anti-theft travel backpacks are so beautiful that perhaps you may want to use them also for your daily use? When purchasing a new backpack, consider what items you will carry and what things you may need to access quickly, and how often. Internal compartments are important not just to keep your things safe, but to keep them organized. The size of your secure travel backpack will also depend on the use. Make a list of all the items that you would like to carry inside the bag during your trips and choose the bag which can fit them all. Also, check the pockets organization and how could you use them. Finally, it is important to choose a backpack fit for your size. If the straps seem to be made for a broad-shouldered woman or even a man, it means that it won’t be comfortable for a slight sized woman. For most of us, the design is also very important. You may probably want beautiful design, in your favorite color. Or perhaps you prefer a neutral design that does not immediately mark you as a tourist. Anti-theft bags brands like Travelon or Pacsafe always propose models with full anti-theft features while other brands prefer to rely on the design of the compartments and anti-slash features. Credit cards, identity cards, and all passports contain Rfid chips with your valuable information on them. RFID protection blocks out virtually all transmissions between 10 MHz – 3 GHz, which covers the radio frequency used in e-passports, credit cards / smart cards and key cards. We hope that our anti-theft backpack review helped you to find the best theft proof backpack for your next adventures. We wish you safe travels!